File image of a U-Haul truck. It has been reported that the lead county in outward migration is the Bay Area. Many are moving out of the Bay, into much more affordable cities. But, before considering packing up, calling your local U-Haul and moving, keep in mind that it'll cost you to move out of the Bay, almost as much as it will to stay. So many people are leaving the Bay Area that there are not enough rental trucks to go around, causing rental truck rates to peak. It costs $121 to rent a U-Haul from Phoenix to San Jose, but it costs $1,301 to rent one from San Jose to Phoenix. Why? Because there are simply no trucks in the Bay. A new study published by University of Michigan professor Mark J. Perry, showed that this was simply a supply and demand issue, SF Gate reports. 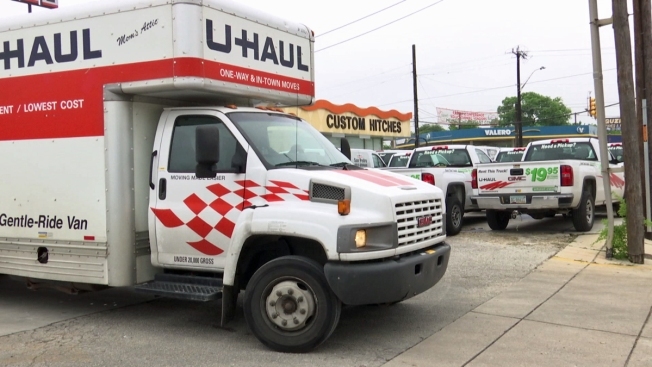 One city in specific has had the greatest issue with his new report, CBS News reported that a San Jose U-Haul business are having trouble getting their rental vans back "because so many are on a one-way ticket out of town." This piece of information led Perry to look into the cost of renting a U-Haul truck with destination to a city outside the Bay Area versus renting one with destination to the Bay. He found that it costs $121 to rent a U-Haul from Phoenix to San Jose, but it costs $1,301 to rent one from San Jose to Phoenix. Why? Because there are simply no trucks in the Bay. Perry also calculated the rate of renting a truck to and from other cities like Las Vegas, Portland, Ore., Nashville and Atlanta, all which were much higher outbound from San Jose. "To help balance truck inventories and take advantage of higher demand in some rental markets than others, it's natural that U-Haul would implement demand-based, dynamic pricing," Perry wrote, according to SF Gate.